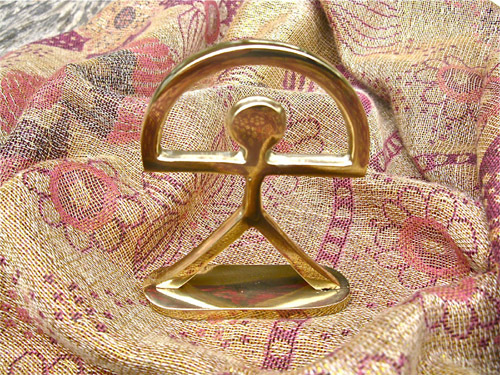 Send some good luck wishes with one of these striking statuettes. The statuette is made of bronze and is a figure of the classic-shaped lucky Indalo, famous in Spain as a symbol of protection and good fortune. Encourage your friends or loved ones to be lucky and positive by sending them this meaningful present for their home or office . . a daily reminder to be lucky and successful. It is beautifully gift wrapped, contains an information card about the Indalo symbol, and we can add a brief message on your behalf. Detail: Indalo statuette measures 9cms in height including base and 7cms across base. There is a felt coating on the bottom of the base. Gift this lucky Indalo statuette and it could give a friend or loved-one the boost they are looking for. Comes gift-wrapped, like all our presents - and we can print a personal message on your behalf.